Apple on Tuesday released the third beta of iOS 4.2 to developers alongside the second beta of iTunes 10.1, making subtle changes to the distributions of the former for both the iPhone and the iPad. iOS 4.2 build releases seem to be following a two week cycle, as the first iOS 4.2 beta was released four weeks ago, with the second beta coming two weeks after. People familiar with the latest iOS beta said it is known as build 8C5115c. The beta contains several significant changes, including an updated version of the modem firmware. Noticeably missing from the beta were AirPlay features from previous builds. The AirPlay button has disappeared from the Photos, Videos, and YouTube apps on the distribution for the iPad. Developers have noticed a bug with the AirPrint functionality. When printing from an iPhone, the image sometimes prints as just the size of the iPhone's screen, not the original image size. The beta also packs a number of smaller additions. According to fscklog, the new beta adds "a larger number" of tones (Google Translation) for receiving text messages on the iPhone 4. 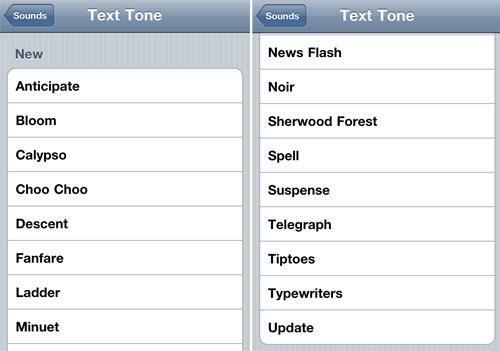 The 17 new SMS ringtones include tones such as "Calypso," "Choo Choo," "Sherwood Forest," and "Tiptoes." In a minor change to the iPad, the Connect to iTunes recovery screen now uses the controversial new iTunes 10 icon. The iTunes 10.1 beta released alongside the iOS 4.2 beta continues to support printing.